Ian Campbell Ross held a personal chair as Professor of Eighteenth-Century Studies until his retirement; he is now a Fellow Emeritus of the College. Among his publications on Irish and British writing of the long eighteenth century are Laurence Sterne: a life (OUP, 2001) and a critical edition, with new introduction, of Sterne's The Life and Opinions of Tristram Shandy, Gentleman (1983; rev. OUP, 2009). He contributed ‘Irish Fiction before 1800’ to the Field Day Anthology of Irish Writing (1991-2002) and ‘Prose to 1800’ to the Cambridge History of Irish Literature (2006). Other publications include Swift’s Ireland (1985), the co-edited volume, Locating Swift (1998), and a chapter on Tobias Smollett in the Edinburgh History of Scottish Literature (2006). A chapter on eighteenth-century Irish literature and national identity will appear in Irish Literature in Transition (CUP, forthcoming 2019), as will entries in the Cambridge Guide to Fiction 1660-1830 (CUP, forthcoming 2019). A co-General Editor of the Early Irish Fiction series (Four Courts Press), he co-edited the anonymously authored Vertue Rewarded (2010), Sarah Butler’s Irish Tales (2010), and Elizabeth Sheridan’s The Triumph of Prudence over Passion (2011), and edited William Chaigneau’s The History of Jack Connor (2013). Editor and principal contributor to Public Virtue, Public Love: the early years of the Dublin Lying-in Hospital, the Rotunda (1986), he was a founder of the Eighteenth-Century Ireland Society (ECIS, 1985-) and of its journal, Eighteenth-Century Ireland (1986-), which he co-edited for 10 years. In 2007, he founded the Eighteenth-Century Literature Research Network in Ireland, linking all interested teachers and students of eighteenth-century literature throughout the island of Ireland, which he convened until 2018. He was a co-organizer of the international Swift350 conference which took place in Trinity College Dublin in June 2017. Professor Ross taught English literature from Chaucer to the present day and has published on American and European literatures from the seventeenth to twenty-first centuries. He is editor of Henry James, The Europeans (1985; rev. 2000) in the Oxford World’s Classics series, and has published essays and articles on writers from Voltaire to Italo Calvino. His sophister option, ‘Detective Fiction’ was the first course of its kind in Ireland. An introduction to Declan Burke (ed), Down these Green Streets: Irish Crime Writing in the 21st Century (2011) was the first overview of Irish crime fiction from 1840 to the present day. With the historian Professor William Meier (TCU), he edited the special issue of the interdisciplinary Éire-Ireland: ‘Crime in Ireland since 1921’ (Spring/Summer 2014). He has recently written a chapter, ‘Crime Fiction’, for Liam Harte (ed), The Oxford Handbook of Modern Irish Fiction (OUP, forthcoming 2018). 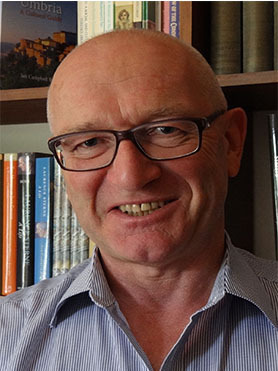 A co-founder of the Centre for Irish-Scottish and Comparative Studies, Ian Ross chaired the international steering committee of the Irish-Scottish Academic Initiative. He is a member of the advisory board of the Journal for Irish and Scottish Studies, the Irish University Review, and Eighteenth-Century Ireland/Iris an dá chultúr. Ian Campbell Ross is Co-Editor for Irish Writing in English for the online Literary Encyclopedia. He welcomes proposals for contributions from both established and young scholars in the field. Editor and translator of Gian Gaspare Napolitano’s In guerra con gli scozzesi as To War with The Black Watch (Birlinn, 2007), Professor Ross has been a visiting professor at the Università degli Studi, Roma Tre, where he is also a membro aggregato of the Centro di ricerca interdipartimentale per gli studi irlandesi e scozzesi. His Umbria: a cultural history (Viking, 1995 and Penguin, 1996) appeared in two extensively revised editions (Perugia: Volumnia, 2012 and Oxford: Signal: 2013). Professor Ross is a frequent lecturer in Italy and was Visiting Professor at the Ateneo de Manila University in the Philippines in 2013-14. In 2007 the President of Italy honoured him as a Cavaliere dell’Ordine della Stella della Solidarietà Italiana (now Ordine della Stella d’Italia).